The angling experience is composed of many facets, not the least of which is an appreciation of the myriad lifeforms with which we share our lakes and streams. An angler who fails to appreciate the birds, flowers, insects, and animals he encounters during a day afield has missed much of what makes any outdoor experience a memorable event. Anglers who appreciate and observe these things will enhance their overall enjoyment of the sport and may also increase their angling success. 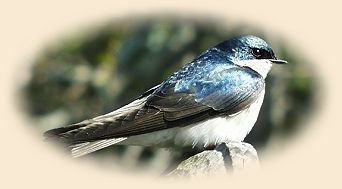 Wherever you fish in the continental United States or Canada one constant avian companion will usually be present, the swallow. During the summer months eight species of swallows call some part of this vast area home. Swallows are insect eaters, and what better place to find insects than over a stream, lake, or pond. This is especially true early in the season when midges, early season caddis, and mayfly hatches may be the only source of concentrated insect protein. Tree Swallows, a cavity nesting species found across the country, arrive in the northern U.S. the first week of April. The first swallows are always encountered over or near water, taking advantage of the readily available insects. All species of swallows are graceful birds which wheel and dive over the water and surrounding land areas looking for insects. Aerodynamically designed by the Creator, they are well adapted for catching insects while on the wing. Swallows have long pointed wings, short legs, and small bills, but their mouths are wide for capturing their winged prey. Observing swallows dipping and darting over the water is a very enjoyable pastime which helps one forget the problems of the world, but it also has an angling benefit. Swallows can tip off the angler to spinner activity and hatches of small insects which the less observant angler might miss. Flying high above the water, especially early in the morning or in the evening, swallows may be feeding on mayfly imagoes/spinners which are beginning their mating flight. Many spinner flights start far above the water, and gradually drop down towards the water surface as the females enter the swarming males. The angler who is aware of the meaning of this activity will be anticipating the resulting spinner fall, and the feeding activity that it may create. Swallows have keen eyesight, and their sudden appearance over the water may signal the beginning of a hatch of insects. The marked absence of these birds in areas where they are normally abundant may be an indicator that no flying insects are available, and the angler may have to resort to fishing nymphs or other patterns to attract the fish. The angler who understands this behavior may quickly take advantage of the situation before other, less insightful anglers, get the picture. Some fly fishermen have expressed concern about the number of swallows they see over their favorite water, fearing that they may be impacting the hatches. Aquatic insects, like all insect species, have a multitude of predators which prey upon them. Even the fish that we highly prize are predators on the hatches. If that were not so we could never catch them with artificial flies. If predators were able to wipe out the prey species, then they too would become extinct. One of the methods that insects use to avoid becoming overwhelmed by the predators are numbers. The number of aquatic insects in a stream, like a spring creek, is beyond imagination. If you have ever experienced a "blanket" hatch of caddis or mayflies, you have some small idea of the tremendous number of insects that are present. These insects, hatching in untold numbers, overwhelm the predators that prey upon them, and insure the survival of the species. Swallows, like most predators, tend to feed on the most abundant and easily captured prey. Thus the minor hatches are usually not targeted as heavily as are the more abundant species. The balance between predator and prey has been going on for thousands of years, and it is only when man interferes that the balance is upset. In the fall swallows gather in huge flocks near lakes and streams before they begin long migration. Telephone wires sag with their numbers as they prepare for their exodus. Suddenly, one day, as quickly as they came, they are gone. This departure is a sign that although warm days may continue for a time, the long, cold days of winter will be soon upon us.